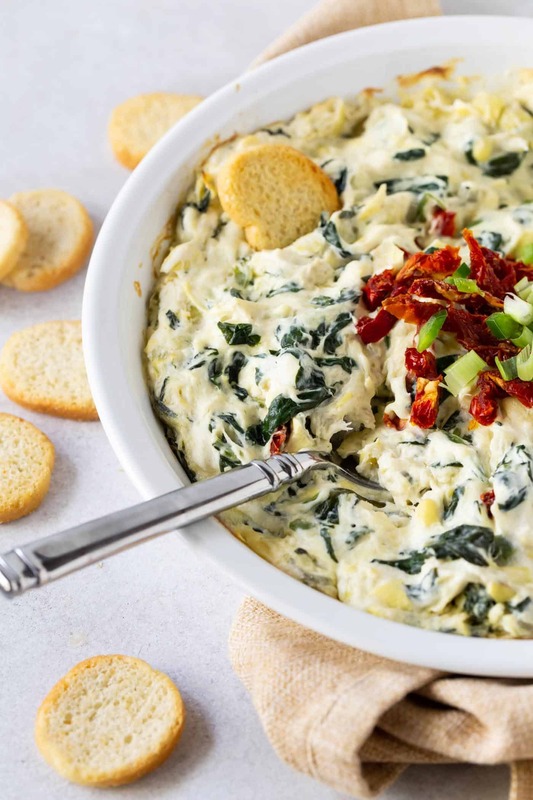 Rich and filling, this Hot Cheesy Artichoke Crab Dip recipe is the special touch your party menu needs to be complete! Perfect for holiday entertaining! Parties fall into many categories: casual get-togethers, formal affairs, cocktail parties and impromptu happy hours. Some involve a lot of planning and some involve none. And sometimes you only need one heavy hitter to stand out in an appetizer spread. This Hot Cheesy Artichoke Crab Dip will easily be the star of any party. 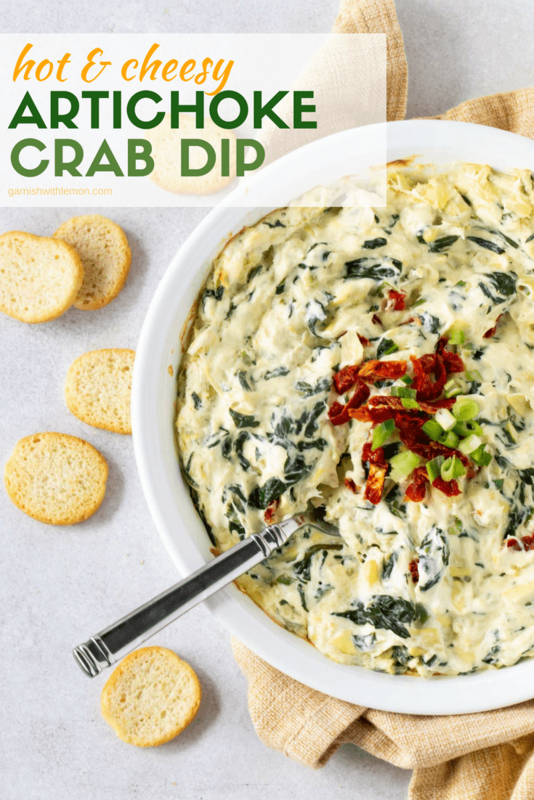 What kind of crab do I use for this dip recipe? Save the fresh stuff for a special dinner. I used canned lump crab meat and it tastes amazing! What makes this different from other artichoke dip recipes? Can I make this Hot Cheesy Artichoke Crab Dip ahead of time? Absolutely! 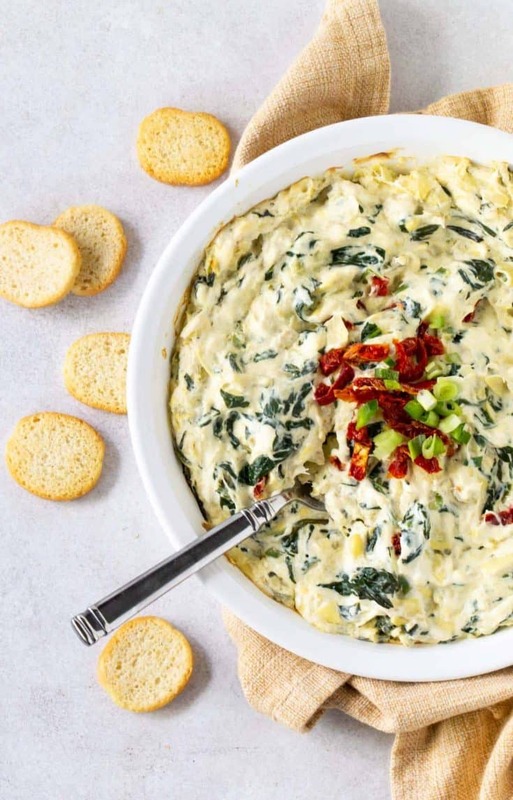 With this Hot Cheesy Artichoke Crab Dip recipe, you don’t need to worry about last minute prep. Simply sauté the spinach, mix the ingredients together and place in the refrigerator until you need it. Pull it out about 30 minutes before baking to take the chill off, then bake in the oven until warmed through. The best part? The bright green color from the fresh spinach shines through and is a perfect balance with the rich crab. Slather on a crostini, grab a cocktail and enjoy! This Hot Cheesy Artichoke Crab Dip recipe can be made ahead of time and will be the star of your next party spread! In a small pan, melt 1 tablespoon butter. Add spinach and cook until just wilted. Set aside. In a medium bowl, stir together cream cheese, sour cream, garlic, lemon juice and hot sauce until combined. 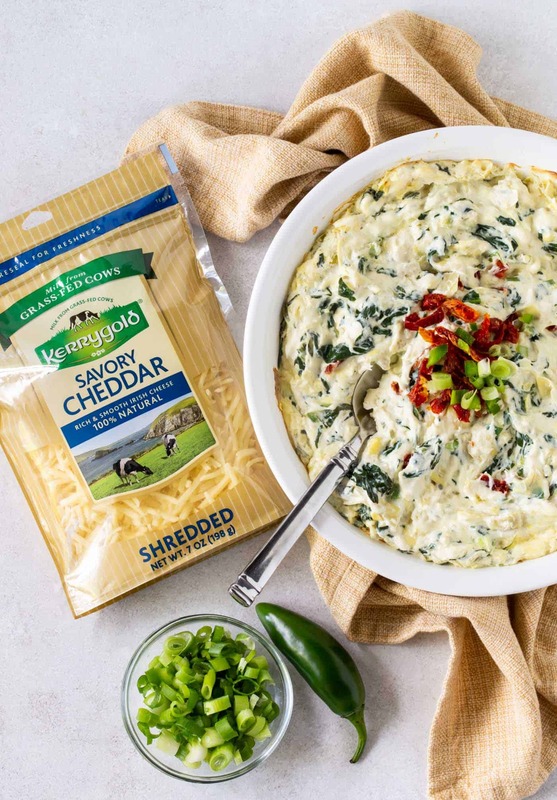 Add shredded cheese, sun-dried tomatoes, spinach, green onions, artichoke hearts, chopped jalapeno, and crab meat. Bake in preheated oven for 20 minutes or until heated through.